When a company acquires another business, it is often justified by the argument that the investment will create synergies. The primary source of synergy in an acquisitionMergers Acquisitions M&A ProcessThis guide takes you through all the steps in the M&A process. Learn how mergers and acquisitions and deals are completed. In this guide, we'll outline the acquisition process from start to finish, the various types of acquirers (strategic vs. financial buys), the importance of synergies, and transaction costs is in the presumption that the target firm controls a specialized resource that becomes more valuable if combined with the acquiring firm’s resources. There are two main types, operating synergy and financial synergy, and this guide will focus on the latter. 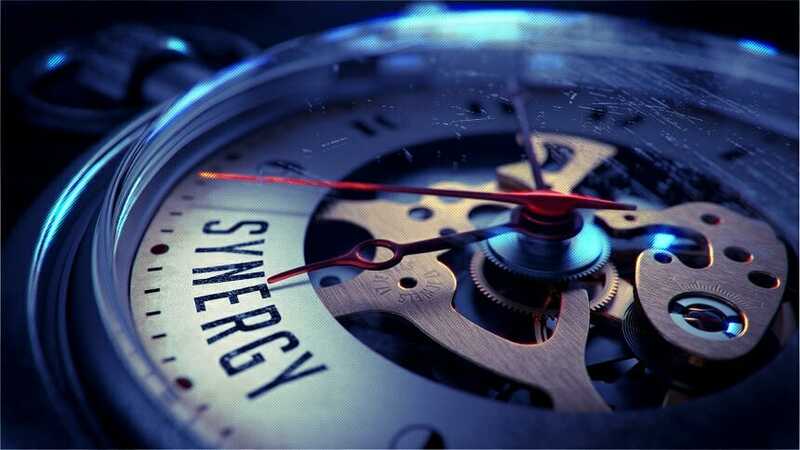 Synergy can be categorized into two forms: operating synergy and financial synergy. Operating synergies create strategic advantages that result in higher returns on investment and the ability to make more investments and more sustainable excess returns over time. Furthermore, operating synergies can result in economies of scale, allowing the acquiring company to save costs in current operations, whether it be through bulk trade discounts from increased buyer power, or cost savings by eliminating redundant business lines. Horizontal Integration: Economies of scaleEconomies of ScaleEconomies of Scale refer to the cost advantage experienced by a firm when it increases its level of output.The advantage arises due to the inverse relationship between per-unit fixed cost and the quantity produced. The greater the quantity of output produced, the lower the per-unit fixed cost. Types, examples, guide, which reduce costs, or from increased market power, which increases profit marginsNet Profit MarginNet profit margin is a formula used to calculate the percentage of profit a company produces from its total revenue. The profit margin ratio of each company differs by industry. Profit margin = Net income ⁄ Total revenue x 100. Net income is calculated by deducting all company expenses from its total revenue which is and salesSales RevenueSales revenue is the starting point of the income statement. Sales or revenue is the money earned from the company providing its goods or services, income. Vertical Integration: Cost savings from controlling the value chain more comprehensively. Functional Integration: When a firm with strengths in one functional area acquires another firm with strengths in a different functional area, the potential synergy gains arise from specialization in each respective functional area. Financial synergies refer to an acquisition that creates tax benefits, increased debt capacity and diversification benefits. In terms of tax benefits, an acquirer may enjoy lower taxes on earnings due to higher depreciation claims or combined operating loss carryforwards. Second, a larger company may be able to incur more debt, reducing its overall cost of capital. And lastly, diversification may reduce the cost of equity, especially if the target is a private or closely held firm. 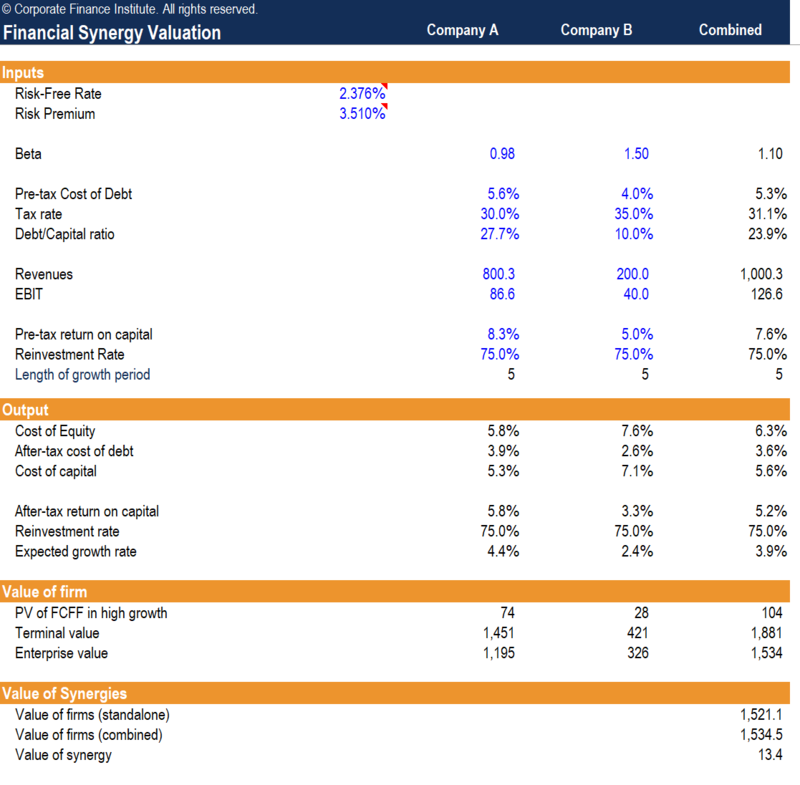 The Synergy Valuation Excel Model enables you – with the beta, pre-tax cost of debt, tax rate, debt to capital ratio, revenues, operating income (EBIT), pre-tax return on capital, reinvestment rate and length of growth period – to compute the value of the global synergy in a merger. Enter the inputs for both the target and acquiring companies. The model will be driven by the variables described above. EBIT: Sum of both firms’ EBITEBIT GuideEBIT stands for Earnings Before Interest and Taxes and is one of the last subtotals in the income statement before net income. EBIT is also sometimes referred to as operating income and is called this because it's found by deducting all operating expenses (production and non-production costs) from sales revenue. The expected growth rate estimated by the product of the after-tax return on capital and the assumed reinvestment rate. The present value of free cash flowsThe Ultimate Cash Flow Guide (EBITDA, CF, FCF, FCFE, FCFF)This is the ultimate Cash Flow Guide to understand the differences between EBITDA, Cash Flow from Operations (CF), Free Cash Flow (FCF), Unlevered Free Cash Flow or Free Cash Flow to Firm (FCFF). Learn the formula to calculate each and derive them from an income statement, balance sheet or statement of cash flows to both firms standalone and combined is calculated by taking NOPATNOPATNOPAT stands for Net Operating Profit After Tax and represents a company's theoretical income from operations. Examples, formula, how to calculate NOPAT. Simple form: Income from Operations x (1 - tax rate) or Long form: [Net Income + Tax + Interest Expense + any Non-Operating Gains/Losses] x (1 - tax rate) (EBIT * 1 – tax rate) and multiplying it by the reinvestment rate. The present value of a growing annuity formula is applied, grown using the expected growth rate and discounted by the cost of capital computed above. The terminal value of both firms standalone and combined is calculated by applying the growing perpetuity formula to the terminal year’s free cash flow. The enterprise value is the sum of both firms standalone and combined present values of free cash flows and the present value of terminal valuesTerminal Value​The terminal value is used in valuing a company. The terminal value exists beyond the forecast period and assumes a going concern for the company.. The value of financial synergies is determined by taking the difference in enterprise values of both firms standalone and combined. The valuation method described above allows us to determine the financial synergies of the combined company. From the analysis, the primary driver of financial synergies is the benefit implied by combining the cost of financing of both companies. The value of financial synergies can be analyzed further by finding the proportion of the value of synergy attributable to the specific sources of synergies discussed above.